Abstract: In the recent years, physics classrooms have been revolutionized by new educational media such as hands on experimental tools, videos from over the web, computer simulations of physical processes, and adaptive learning software that cater to the students’ learning abilities. With the proliferation of computer hardware and software, access to multimedia has surged and the use of multimedia In physics education has extended to hitherto inaccessible places. Emphasis on diversity and inclusion have warranted educational resources to enter the realm of special education, to include students with disabilities. As the current millennial generation of students are conversant with various spheres of technology related to computers, the students have welcomed these educational tools, and have demonstrated significant learning gains when teaching is done with the aid of technology. However, despite best efforts, the world of technology is not flat, due to non-availability of information. This article is intended to inform the recent trends in video and multimedia technology that can be efficiently used in a physics classroom. Education has undergone major transformational changes in the last decade. Several new technologies have evolved in the past decade, enabling visual communication between people across continents. Since education involves transfer of knowledge between people, the process of education leans heavily on available communication methodologies. For this reason, evolution in communication has caused a renewal of interest in education methodologies, thereby contributing to metamorphose changes in a common classroom. Computer based communication like Skype have contributed to peer interactions across continents in classrooms (Macharaschwili & Skidmore Coggin, 2013). Internet based social interactions in the classroom have contributed to enhancement in student learning (Resta & Laferriere, 2007). Several advantages of technology based learning such as accessibility, self-paced learning, and scalability have made computer based learning a favorite choice for many learners. Tutorials that are recorded and transmitted over internet enable learners to learn at their own times of convenience. The learning materials can be paused and played back as many times as the learner needs, without bothering the teacher. Web conferences have enabled eminent speakers in a subject deliver live lectures across continents, without the rigmaroles of travel. Online forums and electronic mail enable synchronous and asynchronous peer interaction. Collaborative workspaces such as Wikis enable students to work in tandem with each other. Such tools have enabled teachers provide learner centric pedagogy (Koller, Harvey, & Magnotta, 2005). Physics is a subject that involves several real world phenomena. In physics, we study nature at various sizes and scales. We study the physical world at the atomic level, and at the astronomical levels, peering into galaxies billions of light years away. We study ultrafast processes such as interatomic collisions, and processes of the universe such as lifecycle of a star. Using simple rules such as Newton's laws or laws of quantum mechanics, we try to make models of the physical world. In trying to solve physics problems, we often have to understand physical phenomena happening in three dimensions. Since many real world problems involve more than one phenomenon, the students need to have a strong understanding of several underlying physics concepts to solve a problem correctly. It has long been understood that textbooks, by themselves, cannot communicate physics concepts effectively to students (Tuite, 1967). Considering the diversity of students all across the globe, the problem of providing physics education is even more complex (Rolin, 2008). Making physics accessible to physically challenged students presents another level of challenge (Hemantha & Srikanth, 2013) . Extensive work has been done in the pursuit of overcoming these challenges in physics education (Long, 2013). Simulations tools such as PhET are now visible in the classroom (Perkins et al., 2006; Wieman, Perkins, & Adams, 2008). To add interactivity and to infuse theoretical learning of physics with real time phenomena, interactive video vignettes in physics have been introduced. These high resolution real world phenomena encourage students to think about and discuss physical processes in the light of their current knowledge of physics (Laws, Willis, Jackson, Koenig, & Teese, 2015). Active learning strategies such as investigative learning that requires the students to think deeply and analyze models critically have promoted internalizing physics concepts. In investigative learning, the students construct their own knowledge from experimental observations, make models based on this knowledge, and design other experiments to test their models. These experiments might either support their models, or they may be required to modify their hypothesis to explain these newly observed facts. Such an iterative model of learning physics from well-designed experiments has been shown to promote critical thinking skills and result in deeper knowledge of physics concepts (Etkina & Heuvelen, 2007). Techniques like interactive lecture demonstrations (ILD) have contributed to students designing their own experiments, making their models of physical systems, and testing their models by modifying their experimental setup (Miller, Lasry, Chu, & Mazur, 2013; Sokoloff & Thornton, 1997). Some of these physics education tools have regularly been reviewed in greater detail (Aravind, Goksu, Miller, & Heard, 2010; Aravind & Heard, 2010, 2011; Aravind & Tangirala, 2012). The issue of incorporating physics lessons to physically challenged students are being studied by physics educators (Bulbul & Eryilmaz, 2010; Şahin Bülbül, 2013). Tracker is a free video analysis tool that can be used to study physical phenomena (Brown, 2009). In a physics classroom, students are typically taught how to analyze physical processes with mathematical models and equations. For example, free fall under gravity is described with an object drawn on the blackboard, and arrows representing velocity or acceleration attached to the object. Students have difficulty making cognitive models relating what they see written on a blackboard with what happens in the real world. From the teacher's point of view, since free fall is a fast process, it is very hard to come up with physical demonstration that illustrates the behavior of freely falling objects. To overcome this difficulty, Tracker can be used to upload videos of physical processes (preferably high speed videos) and analyze them for physical quantities like velocity and acceleration and various points during an object's motion. The lengths can be calibrated using physical measurement devices such as meter sticks, and time can be calibrated based on frame rate of the uploaded video. With these settings, velocities and accelerations can be measured accurately. Several studies have demonstrated Tracker as an effective tool for studying motion and enriching student understanding of intricate physics concepts. Brown and Cox have described some innovative uses of video analysis. In one such application, students captured a high frame rate video of two air hockey pucks colliding on a table. This two dimensional collision was analyzed using the laboratory reference frame and in a center of mass reference frame (where the total momentum of the system is zero before and after collision). Analysis of the collision using Tracker clearly showed the conservation of momentum in the two dimensional collision process studied (Brown & Cox, 2009). A recent study provided evidence to believe Tracker can be used to improve students' understanding of projectile motion. In this work by Wee et al., students were provided a real world video of a ball that is tossed out at a certain angle to the horizontal, describing projectile motion. The students analyzed this video to understand that motion along the horizontal and vertical directions are independent of each other, and to study the motion of the ball along these two directions. This analysis brought to light several misconceptions students had about projectile motion, and helped resolve the issues to gain better understanding (Wee et al., 2012). Along similar lines, Tracker was used to analyze motion of cylinders rolling down an incline. Students learn in their theory class that in the case of objects rolling without slipping down an incline, the work done by friction force is zero. However, this is hard to determine with an interactive lecture demonstration, as it is impractical to track the motion of the rolling object. Tracker was used to capture the rolling motion of a cylinder down an incline at a frame rate of 300 frames/sec. Angular acceleration, linear acceleration, and friction were calculated from the data obtained. From this experiment, it was demonstrated that the work done by friction was zero and that mechanical energy is conserved during the rolling motion of the cylinder. Details about this work can be found in the referenced article (Phommarach, Wattanakasiwich, & Johnston, 2012). Interestingly, Tracker can also be used to study performance of players in board games. Recently, an article discussed using the Tracker software for analyzing motion in a carom board (a popular Asian game). This fun activity triggered deeper mathematical thinking in students, at the same time providing deeper insights into two dimensional collision dynamics (Kang Wee & Kwang Leong, 2015). Tracker can be downloaded from its web page. A screenshot seen from this webpage is shown here in Figure 1 for reference (“Tracker Video Analysis and Modeling Tool,” n.d.). Fig.1. 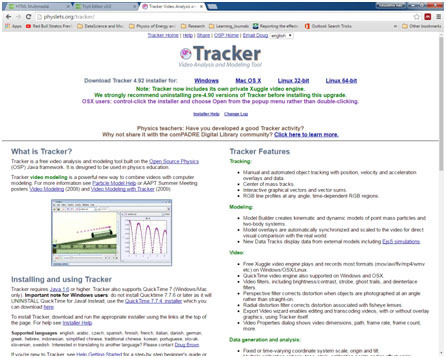 Screenshot of Tracker software. This page acts as a starting point to learn more about Tracker. For a long while, we have known that computer modeling helps students understand several physics concepts better. Computer models help students visualize results, communicate ideas to each other, and discuss complicated physics concepts in a peer group. For example, most physics students start lessons with motion along a straight line (one dimensional motion). Concepts discussed in the first few lectures include speed, velocity and acceleration. Many students have difficulty in distinguishing uniform velocity and uniform acceleration. A computer model showing an object moving with constant velocity (steady motion), versus one showing an object moving with constant acceleration (a car speeding up on a highway) can clearly communicate the idea to students. Although several computer models are available today, not all classrooms use computer models. The primary reasons for teachers not using computer models are (1) the models made by others don’t necessarily fit the teacher’s teaching style, and (2) the teachers themselves are not necessarily programmers, so they cannot make their own models based on their ideas and teaching strategies. In this section, I discuss the Easy Java(script) Simulation tool that empowers non-programmers (usually teachers) make models on physical systems that simulate real world phenomena. The only requirement is that the authors who create models should know the mathematical equations that describe how physical quantities in the system (such as velocity, acceleration, position, etc) evolve with time. However, if the teacher happens to be programmer who can code with Java or Javasript, (hence the name Easy Java(script) Simulation) the simulations can be further enriched to enhance the learning experience for students. Usually, these are described using differential equations. Several simulations have been created using Easy Java(script) Simulations, and the list is growing everyday. In the following paragraphs, we will review some work that has been done in this context, and discuss their relevance. Communication and communication technology is growing every day. Most of our recent advances in communication can be ascribed to a special type of communication satellite called the ‘geostationary satellites’. These are artificial satellites positioned at a certain height above the Earth’s surface such that it remains stationary relative to the Earth. Concepts in physics involving circular motion, rotation, and gravitation are essential to understanding the operation of geostationary satellites. As this involves concepts in three dimensions, it is hard to represent this in a traditional classroom. In order to actively learn the function of these satellites, students should have the capability to modify their position, and velocity to watch the effect on its working. There should be the ability to answer more open questions like how does the position of the satellite relate to radius of the Earth? Why should the satellite be constrained to the equatorial plane of the Earth? etc. A screenshot of this simulation is shown in figure 2(Wee, 2013). Fig.2. 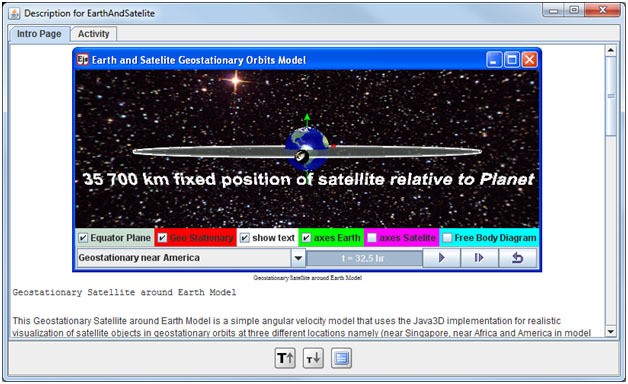 Screenshot showing EJS model for geostationary Earth satellites. The URL for downloading this model is provided in the reference. One of the exciting developments in modern science and technology is the advance in transportation. Expediting modes of transport has a huge significance to availability of food, access to health facilities, and it is a boon for business and economy. One of the relatively recent breakthroughs in transportation in the recent years is the invention of maglev trains. These trains use magnetic forces to counteract gravity, thus enabling a train to be suspended in the air while traveling. Since the train does not have physical contact with the tracks, the dissipative force of friction is greatly reduced, empowering the train to travel at high speeds (about 600 km/hr). Making magnetic levitation work in a stable manner involves a lot of control engineering. Understanding such controls involve complicated visualizations in three dimensions, and mastering such a system enables students comprehend many aspects of science and engineering. To help students grasp these concepts, a model was made using easy java simulations (Dormido, Martin, Pastor, Sanchez, & Esquembre, 2004). In summary, using video and multimedia resources in physics education helps students create multiple representations of physical phenomena, and visualize in three dimensions. Since a large number of physics concepts involve correct visualization to get a good grasp, these resources can take teaching and learning physics to a much higher level. In this article, I have reviewed only very few of all the available resources. The reader is encouraged to look at the references, try them out, and gather appropriate resource from the vast number of resources available on the web. The author can be contacted at the email: varavind@clarion.edu, and would like the readers’ valuable suggestions, comments, and feedback. Aravind, V. R., Goksu, M., Miller, H., & Heard, J. W. (2010). Natural cooling of hot water : An experimental study in thermal processes. Latin-American Journal of Physics Education, 4(3), 552–555. Aravind, V. R., & Heard, J. W. (2011). Mass balance with a meterstick : Teaching rotational equilibrium. Latin-American Journal of Physics Education., 5(4), 686–688. Aravind, V. R., & Tangirala, S. (2012). Open source software for visualization in condensed matter Physics. Latin-American Journal of Physics Education, 6(4), 538–540. Bulbul, M. S., & Eryilmaz, A. (2010). How does a blind student measure three basic units in mechanics. In 27th International Physics Congress Book of Abstracts (p. 352). Dormido, S., Martin, C., Pastor, R., Sanchez, J., & Esquembre, F. (2004). Magnetic levitation system: a virtual lab in “easy Java simulation.” Proceedings of the 2004 American Control Conference, 4, 3215–3220. Etkina, E., & Heuvelen, A. Van. (2007). Investigative Science Learning Environment – A Science Process Approach to Learning Physics. In E. F. Redish & P. J. Cooney (Eds. ), Research-based Reform of University Physics, Reviews in Physics Education Research Vol. 1. American Association of Physics Teachers, College Park, MD. Koller, V., Harvey, S., & Magnotta, M. (2005). Technology-Based Learning Strategies. Social Policy Research Associates, (510), 1–44. Long, J. M. (2013). Recent advances in distance education for physics students. Proceedings of The Australian Conference on Science and Mathematics Education (formerly UniServe Science Conference), 0(0). Şahin Bülbül, M. (2013). A Description of a Blind Student’s Science Process Skills through Health Physics. European J of Physics Education, 4(2).